553-acre park began with an initial land purchase by the State of Vermont in 1975. It is named for Niquette Bay, the local name for an indentation along the northeastern shore of Lake Champlain’s larger Malletts Bay. 4700 feet of scenic rocky and sandy shoreline along the bay comprise the park’s southern boundary. The property, much of it farmed and pastured through the 1800’s, is today predominately forested. Two long ridges with summits rising to over 400’ elevation run parallel along either side of a flat, sandy terrace bisecting the property. This terrace, in turn, is bisected by a brook and associated ravine. This brook, over 1000’s of years, has carried away sand and silt as the ravine was carved, depositing it into Lake Champlain and forming the sandy but shallow beach along the eastern half of the park’s shoreline. The westerly half of the park shore is of dramatically different character. Here, sheer cliffs of dolomitic limestone rise abruptly from deep water to heights exceeding 60’. These cliffs form the headwall of the western of the two ridges that cut through the park. The park’s trail system accesses high points along each of these ridges, from which impressive vistas overlook Malletts Bay to the south, the Green Mountain ridge line to the east, and the Lake Champlain Islands to the west. Here's the our members favorite photos of "State Parks in Vermont". 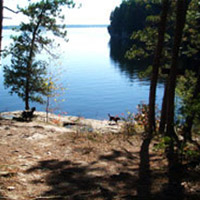 Upload your photo of Niquette Bay State Park!